Just last week, influential bass player Paul Raven passed away, and today’s post pays tribute to one of his earlier bands, Neon Hearts. A few years before Paul would co-form Killing Joke, he would join the ranks of fellow UK punk rockers to form Neon Hearts in 1977. The band would embellish upon the bare-bones punk structure, complimenting it’s furious rhythms with blaring saxophones, a precursor to the sonic experimentation that would soon birth the post-punk movement. The band gigged regularly, saving up cash to record their first single, Regulations, released in December, 1977. After more relentless touring, the band gained a relatively large following and signed to Satril Records. However, the glory of a recording contract did little to stop the band from splitting at the seams far too soon, mostly thanks to Satril Records’ constant meddling in the band’s creative process. The band split just before their first full length, Popular Music was released in April of 1979. I’ve uploaded both sides of their debut Regulations single for your listening pleasure. Enjoy! Though the band’s records are tough to come by in their original form, Overground Records has compiled their discography (both singles and their full length) into one collection, also entitled Popular Music. Click below for a purchase link. Purchase Popular Music from Overground Records. Today’s post features Belgian new wave act the Neon Judgement, a two piece outfit currently reactivated after a temporary hiatus. 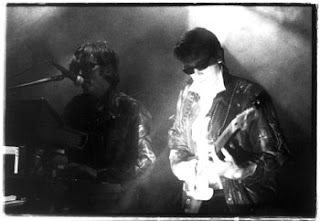 Neon Judgement formed in a town outside of Brussels in 1981, and since then the duo of TB Frank and Dirk Da Davo have been creating synth driven music with a dash of electronic violence and a sprinkle of rock and roll ideology. Neon Judgement would release several records and remixes before briefly disbanding in 1998. However, as the two reunited in 2004 to promote an upcoming remix collection in Europe, the band was also reactivated as a creative unit. In 2005, the band also released The Box, a 2cd set comprising live tracks and rarities alongside classic cuts. 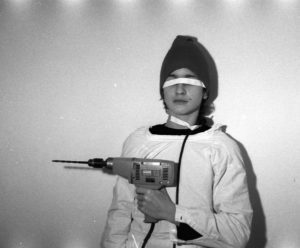 On the side, member Dirk Da Davo also spearheads the Neon Electronics side project, composing new material and reworking old tracks. The first of two tracks I’ve uploaded is the top-off track from the 1986 record Mafu Cage. The second hails from 1989’s General Pain and Major Disease. Today’s post features Chris + Cosey*, an eclectic and prolific duo formed in the wake of Throbbing Gristle’s initial demise. In 1981, hot on the heels** of their previous outfit’s split, members Chris Carter and Cosey Fanni Tutti formed a duo to continue their musical experiments. Though their approach still featured some sonic similarities to Throbbing Gristle’s pioneering industrial work, Chris + Cosey would apply more song structure and pop sensibilities to some of their records, whilst others would meander just as dangerously. Chris + Cosey would release over a dozen albums on several different labels, including their own Conspiracy International (aka CTI) label, and would record several collaborative works with the likes of Monte Cazzaza***, Coil, and the Eurythmics throughout their tenure. 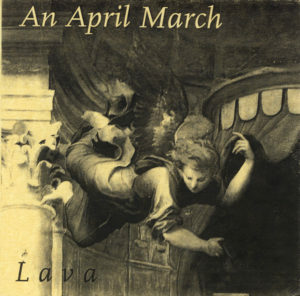 Though both members have explored solo ventures under CTI, the duo still collaborate together, these days as Carter Tutti, and the pair have also reactivated Throbbing Gristle with other original members Genesis P-Orridge and Peter Christopherson, and have released an EP and a full length under their original outfit. 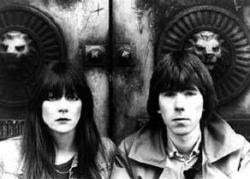 Though my favorite Chris + Cosey track remains ‘Haunted Heroes,’ a brief haunting ambient piece, I’ve uploaded three of their more synth/wave tracks for your listening pleasure. The first opens their 1985 record Techno Primitiv, the second hails from 1989’s Trust, and the third is featured on 1991’s Pagan Tango. *normally, there’s an ampersand in their name instead of a plus sign, but blogger won’t let me use one. ***who may appear shortly in these pages. 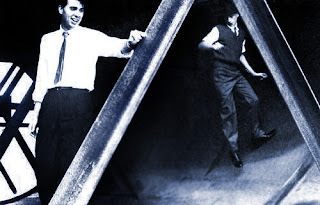 Today’s band is a lesser post-punk classic, UK act The Sound. The band formed in 1978 as the Outsiders, switching up their name in 1979 after a quick lineup shift. Their sound was akin to the likes of the intitial wave of post-punk, and the band toured with the likes of friends and cohorts the Chameleons, Echo & the Bunnymen, Au Pairs, and the Comsat Angels. Singer Adrian Borland’s lyrics would often ruminate on existentialist affairs and paranoid observations, while the music would mix synthesizers and horns with fast-paced rhtyhms and guitars. 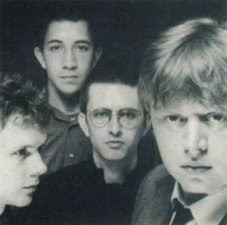 Throughout their tenure, the band recorded five full length records, a few peel sessions, and a slew of EPs and singles before their split in 1987, just after a canceled European tour. Adrian would persue a solo career, but the band would never reunite, as keyboardist Colvin “Max” Mayers would pass on in 1993 and Adrian Borland would commit suicide in 1999. However, the band lives on- several reissues of the Sound’s catalog and tributes to their material have since materialized, and the band’s influence can be heard in many modern post-punk acts. I’ve uploaded two tracks- the first from their second record, 1981’s From the Lion’s Mouth and the second a track from their 1980 debut Jeopardy. Even though most of the band’s material was released for the first time on CD earlier this decade, those copies are still hard to come by. Keep your eyes peeled for them! Though I’ve posted material featuring today’s artist’s contributions, I’ve yet to post his own material, so without any further adieu, today’s post features German jack-of-all-trades, Alexander Von Borsig. Known best for his contributions to Einstürzende Neubauten, P1/E, Crime + the City Solution, and most recently the Tiger Lillies, Alexander Von Borsig (currently active as Alexander Hacke) began making music at the tender age of 13. Under several monikers, he released homemade cassette tape and single recordings of his own material, as well as work with Christiane F. in Sentimentale Jugend. Soon after these tapes were released, he would join as guitarist of experimental act Einstürzende Neubauten (at age 15), and he remains with the band to this day, switching to bass guitar most recently. I’ve uploaded three tracks for you folks today, the first a single A-side for the song ‘Hiroshima,’ and the second, the entire ‘Japanisch’ single. Enjoy! Though there are several clips of Alexander Hacke performing with his other outfits, I can’t seem to find anything on his earlier material for web viewing- though Einstürzende Neubauten’s Liebeslieder dvd features a live piano performance of ‘Hiroshima,’ and is available on netflix for any curious parties. A large group of cohorts and I just caught the NYC premier of Anton Corbijn’s Control this weekend, a biopic about the life and times of Ian Curtis. Though today’s post doesn’t feature Joy Division OR New Order, it features one of their contemporaries, fellow Manchester based Factory records outfit Crispy Ambulance, whose singer would fill in for Ian Curtis during one ill-fated night, culminating in an audience riot. 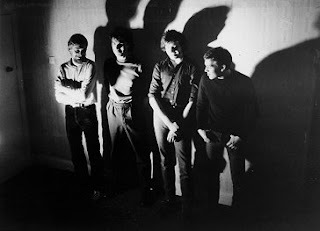 The band, formed in 1977 by Alan Hempsall and Robert Davenport, was unfairly dismissed as Joy Division knockoffs during their short recording tenure. Despite these accusations however, Crispy Ambulance had their own innovative style to add to the budding post-punk movement, and often incorporated a more minimal and dreamy sound to their compositions. The band would flesh out their lineup and record a handful of singles in 1980 and play shows alongside the likes of prominent bands such as Killing Joke. Upon Factory’s request, the band would sign to record the full length record The Plateau Phase and a few assorted singles. Unfairly written off (along with fellow label mates Section 25, previously featured on these pages), the band would split in 1982, releasing a collection of unreleased tracks soon after. Despite their demise, the band would reunite in 1999 to record two more records into the new millenium, and are together to this day, playing sporadic gigs in their native Manchester. I’ve uploaded a handful of tracks…The first, a personal favorite from the 1982 record The Plateau Phase and the second, a lone 1984 single compiled on a resissued version of said album. …and here’s a live clip of the band performing ‘The Presence’ in their earlier incarnation. Today’s post features Austrain wave act ZYX, little known duo whose first and only record, Trust No Woman was released in 1981. Since it’s inception, it’s become a pioneering electronic recording and has recently seen an expanded cd rerelease, including a slew of earlier recordings as bonus tracks. Little information is known about this gem, aside from a few bits about the duo’s work in performance arts and television after releasing Trust No Woman. If anyone else has anything else to contribute, chime up! Otherwise, here’s two standout tracks from Trust No Woman for your enjoyment. Today’s band is Adult., a currently active synthpunk/wave unit hailing from Detroit, Michigan. Consisting of married couple Adam Lee Miller and Nicola Kuperus, their sound blends female vocals and harsh electronics. Since their inception, Adult. has helped bring dance and synthpunk back to prominence under the guise of a budding electroclash movement. 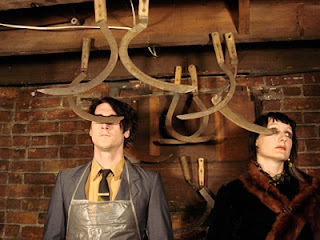 The two-piece outfit formed in 1998 under the name Plasma Co., and has since independently released four full-length records, one EP, and a series of 12” singles under their proper name. The band has since grown notorious for their captivating live performances and a slew of altered remixes of their contemporaries and influences. Here’s a live video of the band performing ‘Bad Ideas’ in 2005. The track appears on their third record, 2005’s Gimme Trouble. Today’s band, New Zealand wave act Car Crash Set, formed in 1983, rising from the ashes of pioneering underground post-punk act Danse Macabre. 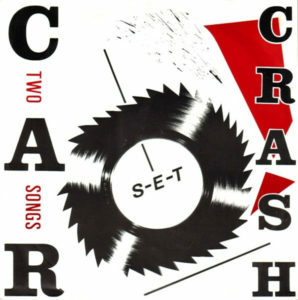 Upon the band’s demise, vocalist Nigel Russell would recruit a series of synth players pursue a more electronic direction with Car Crash Set. (Side note: their name points to the influence of pioneering wave track ‘Warm Leatherette’ by the Normal and the Ballard novel that inspired it, Crash). Download links removed! Purchase the killer CCS reissue from Anna Logue records by clicking here! Otherwise, that’s all I have on these gentlemen. Any more information about this fine band would be most appreciated!